This past weekend, Nick and I went to check out the new Bleeding Heart bakery in West Town, which unlike other Bleeding Heart locations has a cafe which serves brunch M-F from 7am -4pm and 57 straight hours starting on Friday at 7am and ending on Sunday at 4pm. The cafe’s menu includes 7 vegan entrees. Nick ordered the Housemade Vegan Biscuits and Gravy and I had The Roots skillet. At first I wasn’t blown away by the skillet, because I was eating every vegetable on it’s own. 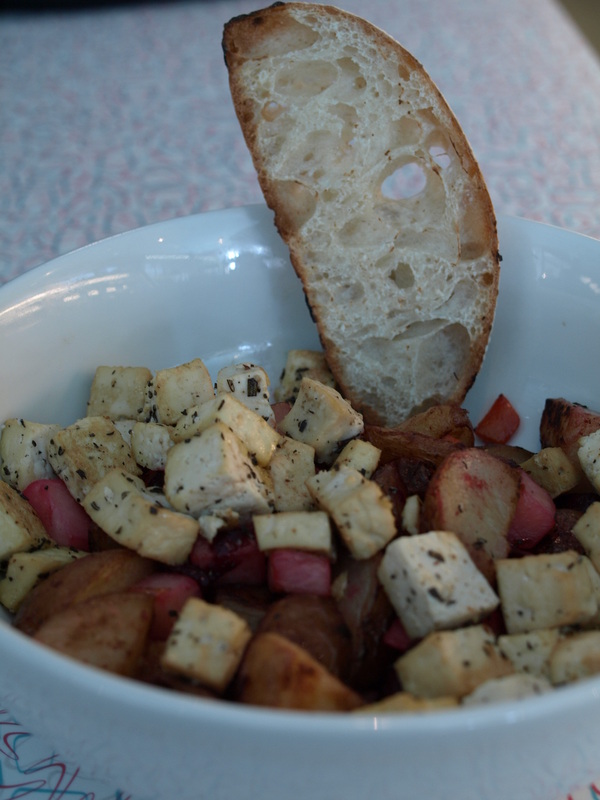 The skillet consisted of potatoes, turnips, carrots, beets and seasoned tofu. However, when I started eating the tofu with the veggies I discovered that all of the flavors blended together really well. I left feeling more than satisfied since the bowl was big and the root veggies were filling. My only complaint is that I wasn’t given any vegan margarine or jelly or anything to go with my bread, which was pretty dry. The biscuits from the biscuits and gravy were probably the fluffiest biscuits I have ever had! Normally I don’t get biscuits because more often than not they’re hard or mealy or too dense, but these were perfect! 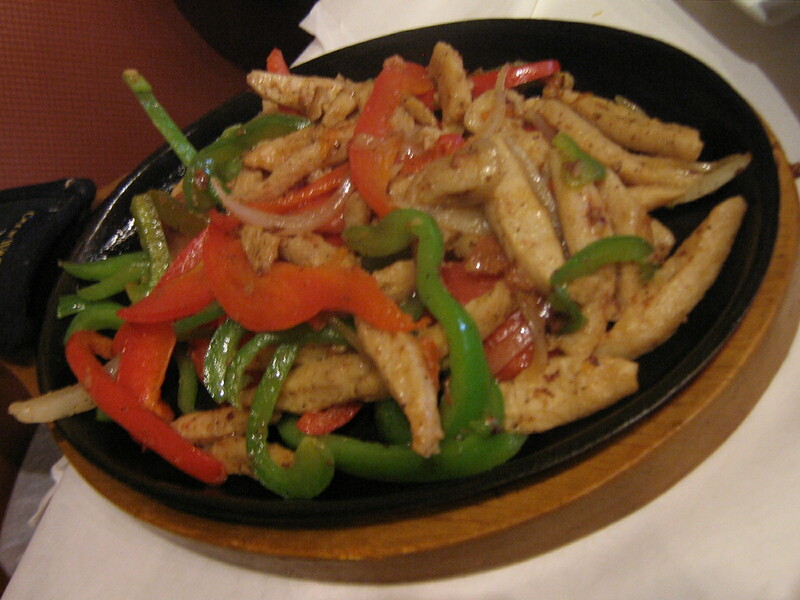 They also came with seasoned tofu, which was the only disappointing part of the dish. It would have been nice if it was a tofu scramble with a few veggies thrown in, like onion and tomato or it they were served with Upton’s Naturals sausage instead of tofu and some roasted poatatoes. 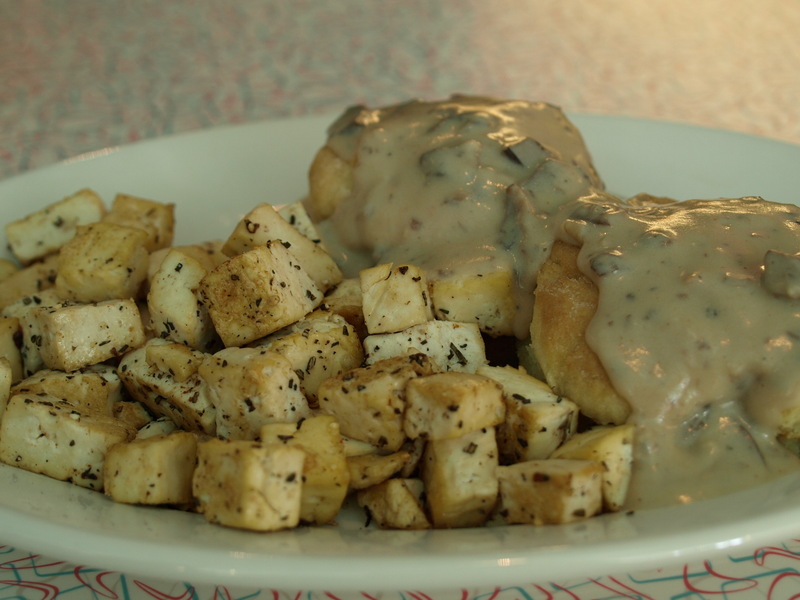 Then the Housemade Vegan Biscuits and Gravy would be AMAZING! As they are now, they’re just good. For dessert I took home a mini vegan Sweet Potato Pie, which was good, but I’m not sure it was $7 good. 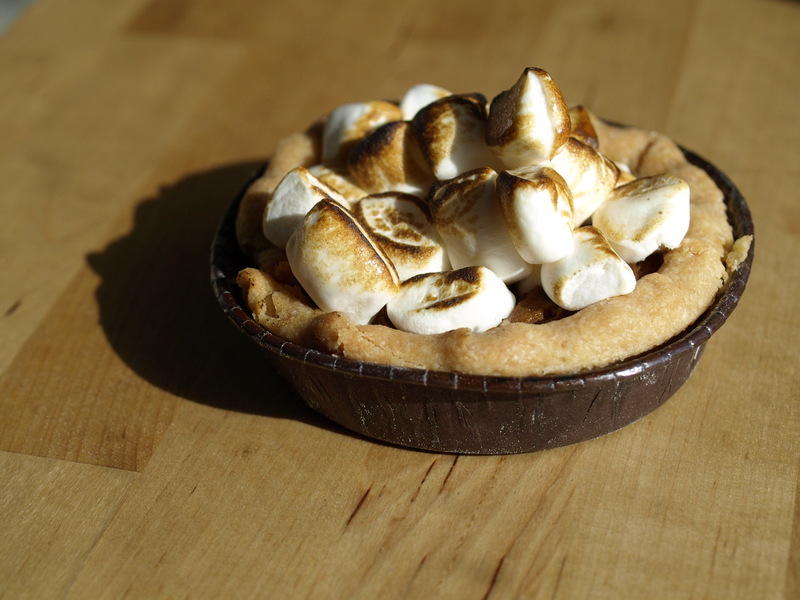 I did love the toasted Dandies on top, though! I will have to try to replicate this at home. Overall it was a pretty good meal. I’m looking forward to going back and trying some more of their vegan offerings. Beware if you go late on a Saturday morning, though, because the place was bumping, so we had to wait about 20 minutes and I’m pretty sure there were only two waitresses working, so we didn’t get the best service. At some point last year I bought a $20 Groupon to Cousin’s Incredible Vitality (3038 W. Irving Park Rd, Chicago 773-478-6868) and Nick and I finally cashed it in last month. Cousin’s is both entirely raw and entirely vegan. We weren’t really sure what to expect when we went in. Neither of us have a lot of experience with raw food, but the little bit of experiece we do have has been pleasant. Still, we were both a little nervous. The place itself has simple decor and the tables are arranged cafeteria style, so on occasion you may find yourself seated next to a complete stranger, but I’m ok with that. However, it took a while for us to be seated and for someone to come take our order. When our server did stop b she was friendly, and brought us a carafe of water. This was a pleasant surprise; reviews we had read online said they normally don’t bring water until you received your meal. Plus, lately its felt like we’ve had to chase down waitstaff at other establishments for water or appropriate it ourselves. Cousin’s, however, provided us with ample water. The wait to place our orders was longer than one would normally expect, but at least we did have plenty of time to peruse the menu. We ordered the RAWmazing Antipesto ($7) as a starter, which consisted of zucchni frittes, onions rings, fakin bacon, bell peppers, tempura with olive and pumkin seed cheese. It was not what I expected at all, but it was good. The olive and pumpkin seed cheese dip was excellent and I probably could’ve just eaten that stuff by itself, but it complimented the rest of the appetizer well and it was all gone long before our entrees came out. 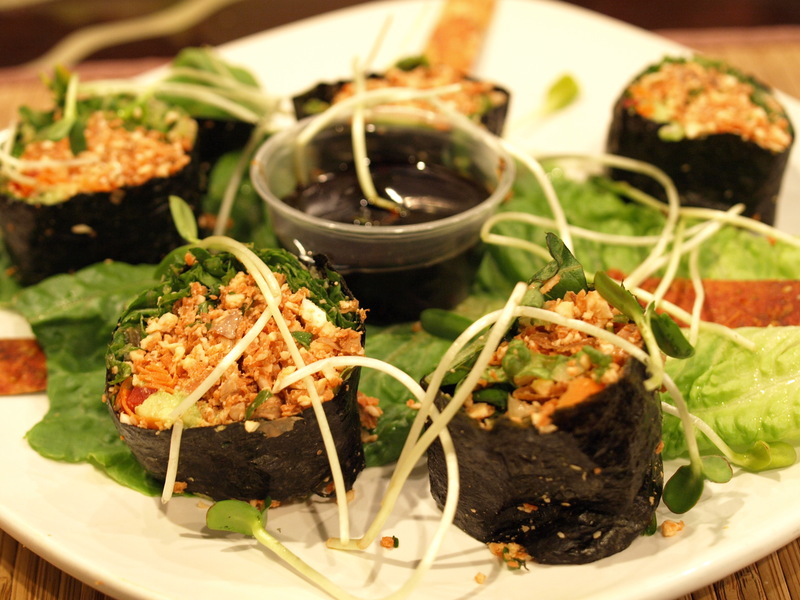 For my entree, I ordered the Sushi Maki ($10) – 5 rolls of Nori rolled sprouts, almond pate, avocado and greens served with soy sauce on a bed of romaine lettuce. I was dissapointed in my entree. The rolls didn’t stay together very well, they were dry and they didn’t have much flavor. They also weren’t served with any wasabi paste and the soy sauce they were served with was incredibly salty. I was glad they were served on a bed of romaine lettuce cause that helped cut some of the salt. Needless to say, I don’t think I’ll be ordering this entree again. 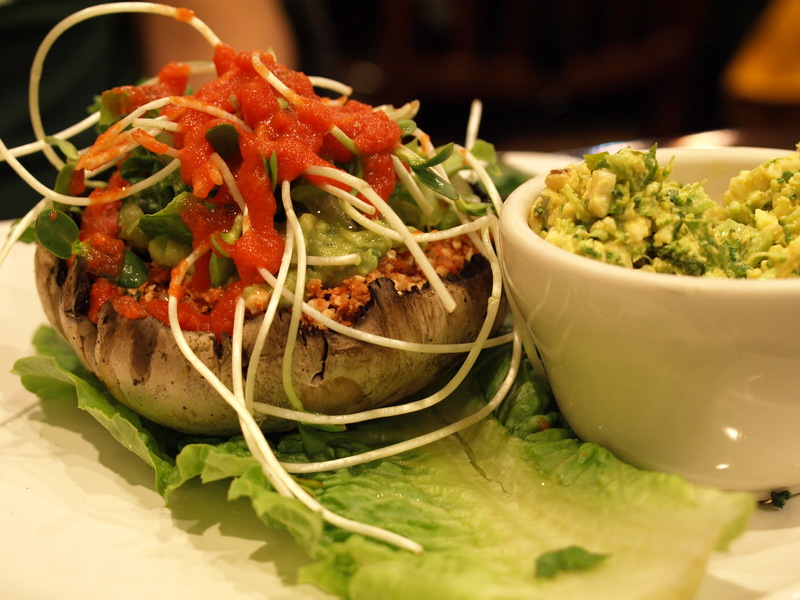 Nick ordered the Portabella Melt ($10) – A marinated portabella mushroom stuffed with seed cheese and avocados, topped with sprouts and a tomato sauce, served with a side salad of broccoli, cauliflower and spices. We both agreed that he got the better of the two entrees. The meaty consistency of the portabella mushroom made you feel satisfied and it’s filling was flavorful and went well with the mushroom. The side salad of veggies and spices was also very good. I would definitely order this again! We finished dinner off with a piece of raw strawberry cheesecake topped with banana. As far as cheesecakes go it was alright. We did both leave the restaurant satisfed though. Since this is a raw organic restaurant the prices are a bit higher than places I traditionally go, especially when taking portions into account. However, there were a lot of items I was curious about on the menu, which I would like to try, so I’ll definitely be back. I feel like Cousin’s is the perfect place to go when you’re looking for something light and healthy, especially on those hot summer days when you don’t feel like cooking, but want something a bit more elaborate than a salad. They also offer a detox program for those who are interested and raw cuisine classes. 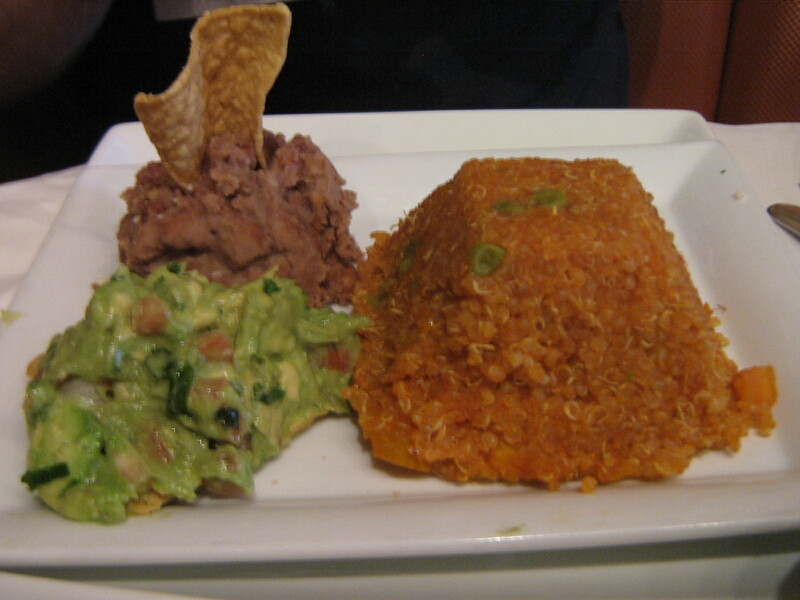 Two weeks ago, Native Foods Cafe, hosted a series of promotional complimentary dinners. The chain, which is based out of California has opened a location in Wicker Park (1484 N Milwaukee Ave. 773-489-8480) and will be opening locations in Lakeview (1023 W Belmont Ave. 773-549-4904 -Opens Aug. 30) and the Loop (218 S Clark St. 312-332-6332 – Opens Oct. 1) in the next few weeks. Nick and I were lucky enough to get to try it during one of these events. While we were waiting in line, a Native Foods employee came around to answer questions and give suggestions. She informed us that everything on their menu was vegan and encouraged us to try a little bit of everything, so we did as she said and went all out. The restaurant itself had that clean, polished, uniform look of any chain establishment. Dark wood tables, outdoor seating, colorful chalk drawings on the wall, the decor brought Flat Top Grill to mind, as well as a recipe or two on the wall/table tents. I ordered the Sweet Potato Taquitos, the Native Soul Bowl, the Oklahoma Bacon Cheeseburger, a Lavender Lemonade and a Strawberry Shortcake Parfait. 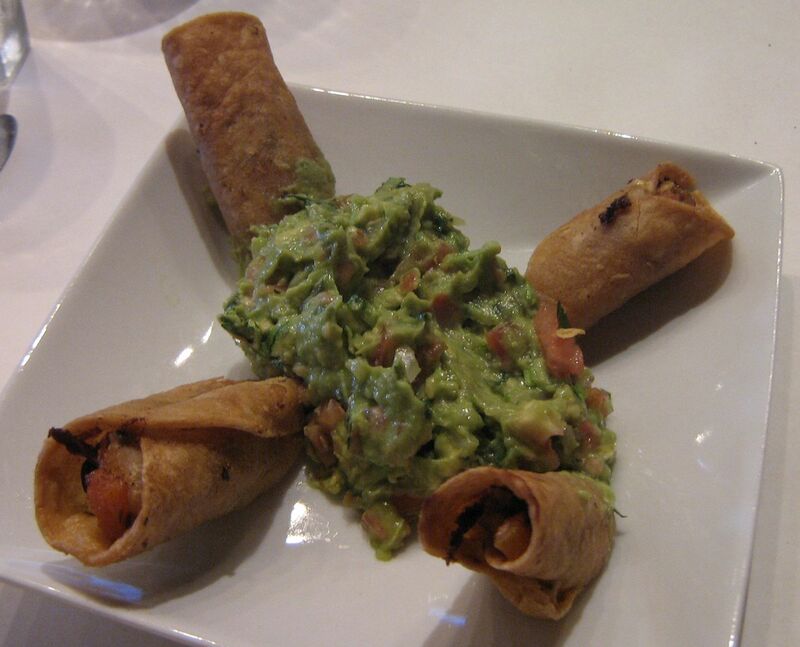 The Sweet Potato Taquitos were 3 small deep fried tortillas filled with mashed sweet potatoes, topped with a Chipotle sour cream and accompanied by a scoop of guacamole. I wasn’t very impressed by these. The flavors were very mild and it seemed to be more deep fried tortilla than anything else; though I liked the guacamole, at $6.95, I don’t think I’d order these again. The Oklahoma Bacon Cheeseburger was comprised of thinly sliced seitan (not a patty), melted cheddar, caramelized onions, fried pickles and bacon on a bun with lettuce, tomato, carrots, onions, and ranch dressing. The menu also lists it as being topped with bbq sauce, but mine was not or if it was, it wasn’t enough to notice, though I think bbq sauce would make an excellent addition to this sandwich. The sandwich came with a choice of sides* and I decided to go the traditional route and get fries. Out of everything I ordered, this was my favorite item. The cheese was cashew based and it was pretty much what I was expecting. The burger was huge! I had to use a knife and fork to eat it. The seitan was tender and I liked the addition of fried pickles. I would have liked some bbq sauce to add to it, because I wasn’t very impressed by their ranch dressing, which was runny and lacked bite. I also wasn’t very impressed by the Native Seasoned Potato fries, which were shoestring fries topped with a tiny bit of seasoning. I like my seasoned fries to be covered in seasoning, like the ones they serve at Quesadilla or my shoestring fries to be just a little greasy and salty, like Handlebar fries. I guess next time I’ll have to try out their Sweet Potato fries. At $9.95 it was probably the best deal and comparable to something you’d get from the Chicago Diner. 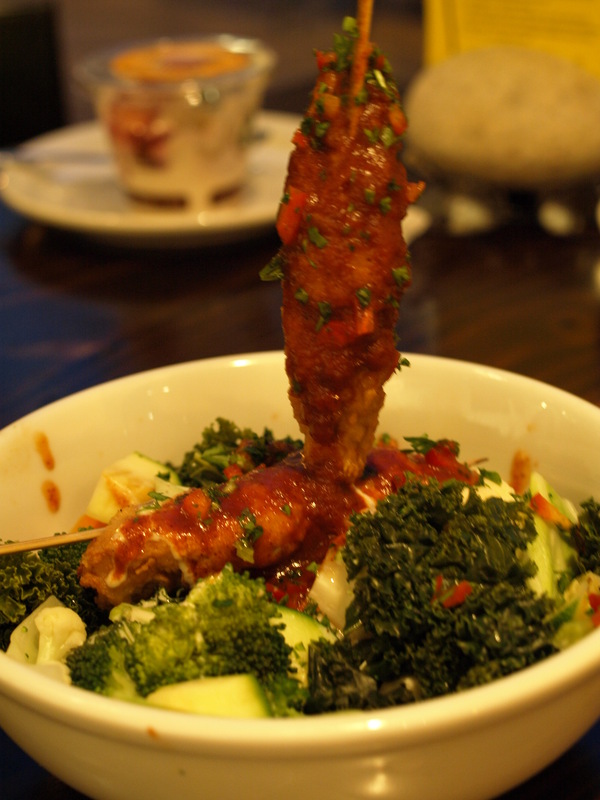 The other entree I ordered was the Native Soul Bowl, which consisted of Native Chicken served atop a bed of steamed veggies, redbeans, and rice topped with ranch and bbq sauce. It was also supposed to be accompanied by a piece of cornbread, but unfortunately they were out of corn bread when I visited. Like the burger, it also came with a side, so I chose the side salad. I was underwhelmed by the Soul Bowl. I really, really, liked the Native Chicken strips, but I felt the Soul Bowl was something I could have just as easily made at home and it wasn’t really worth $9.95 to me, so like the Sweet Potato Taquitos, I’ll probably skip it next time. However, I was very impressed by the Mini-green salad that came with the Soul Bowl*. The balsamic vinaigrette dressing was rich and delicious and the salad itself consisted of greens topped with beets, carrots, sprouts, yum! 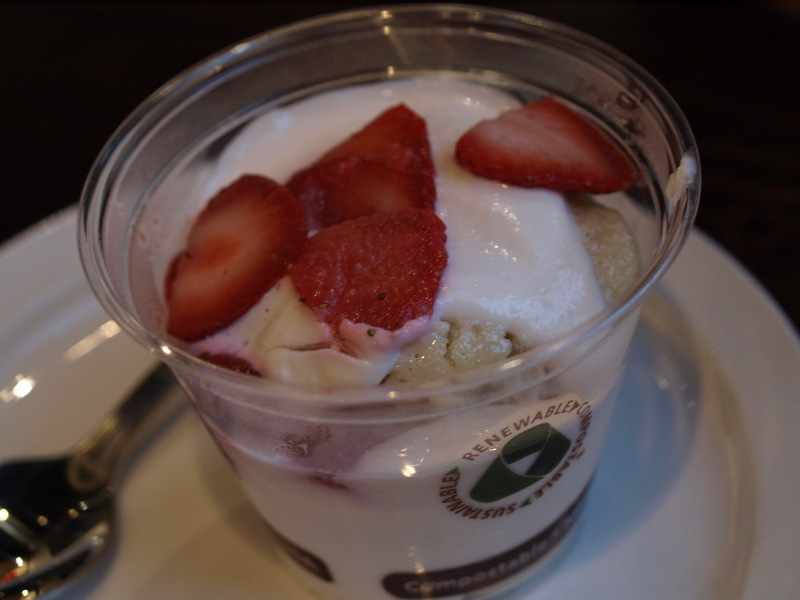 Finally, for dessert I had the Strawberry Shortcake Parfait, which was moist vanilla cake layered with almond cream and fresh strawberries. This was a refreshing and delicious way to end the meal. 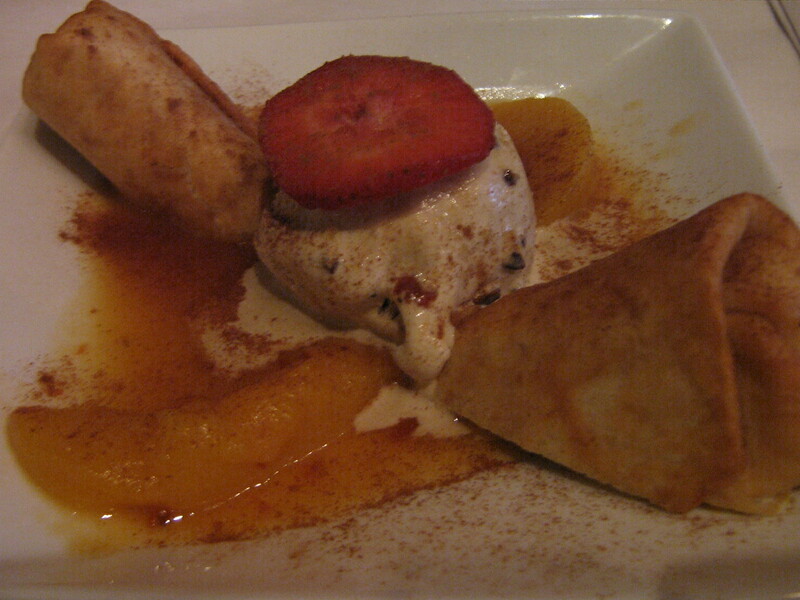 The dessert was sweet, but not too sweet and desserts priced at $2.95 mean I’ll definitely be getting dessert again. Although it’s great that Chicago’s vegan options are growing, it’s unfortunate that the growth is in the form of a chain. Chain establishments tend to lack variety and imagination, since their goal is uniformity and predictability. I like that places like the Chicago Diner and Handlebar change their menu on a regular basis and offer a wide variety of specials, though the establishments themselves are not vegan. I feel the need to support local independent businesses; though, obviously supporting entirely vegan businesses is also necessary. Ah, if only I could have the best of both worlds – lots of local independent vegan joints with variety in their menus. So, though I probably won’t be a regular customer at Native Foods, the Wicker Park location is within walking distance of my home, so I know I’ll be back soon. *Addendum: I’ve been back since the promotional event and discovered that sides are only included with sandwiches which are on special on any given day, otherwise they’re extra, so in reality if you’re getting a sandwich and a side expect to drop $12 or so. I ordered the Native Chicken Wings, the Gandhi Bowl, the Super Italian Meatball Sub and a Watermelon Fresca. The Watermelon Fresca was the first thing I got to sample. Normally I only drink water at meals but since this meal was a freebie I decided to go all out. Honestly, I have never had a natural watermelon beverage so when I walked in and there was one I figured I’d try it out. It was so delicious and refreshing I ended up going for 1 or 2 refills. 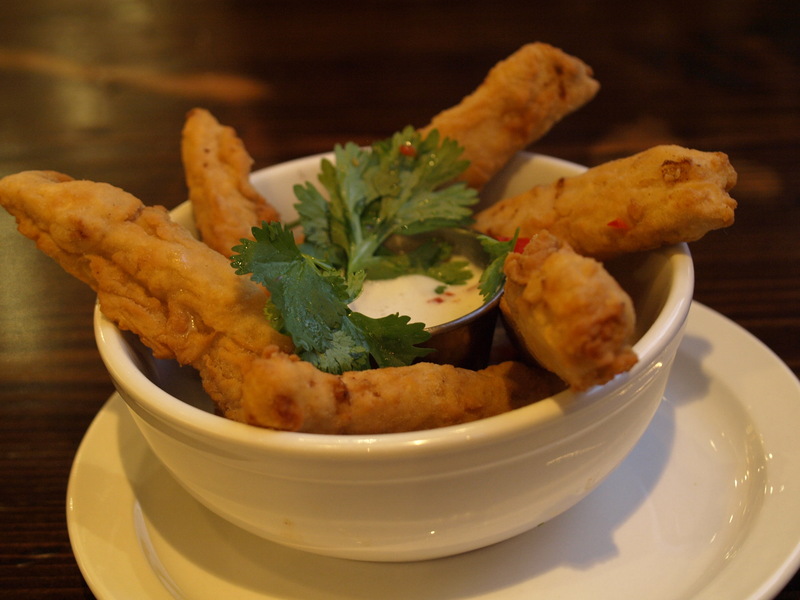 The Native Chicken Wings were served with your choice of ranch or buffalo sauce for $6.95. I chose the ranch dressing, though being from Buffalo originally I have to point out that the rest of the US has it wrong; you serve bleu cheese with wings, not ranch dressing. Its an insanely common failing, and one that no one outside of Buffalo realizes is wrong (Which then brings the question: has anyone developed a vegan bleu cheese?) That being said, it complimented the wings well. In fact, the Native Chicken Wings were my favorite part of the meal with a great flavor & texture without going the creepy route involving a fake bone. They’re a bit pricey, but I could order them alone as a light meal or split them with a friend and feel good about it. The Super Italian Meatball Sub consisted of sausage seitan meatballs, marinara sauce, caramelized onions, roasted sweet peppers, pumpkin seed pesto and ranch dressing on a baguette, served with a side of your choice, I chose fries. 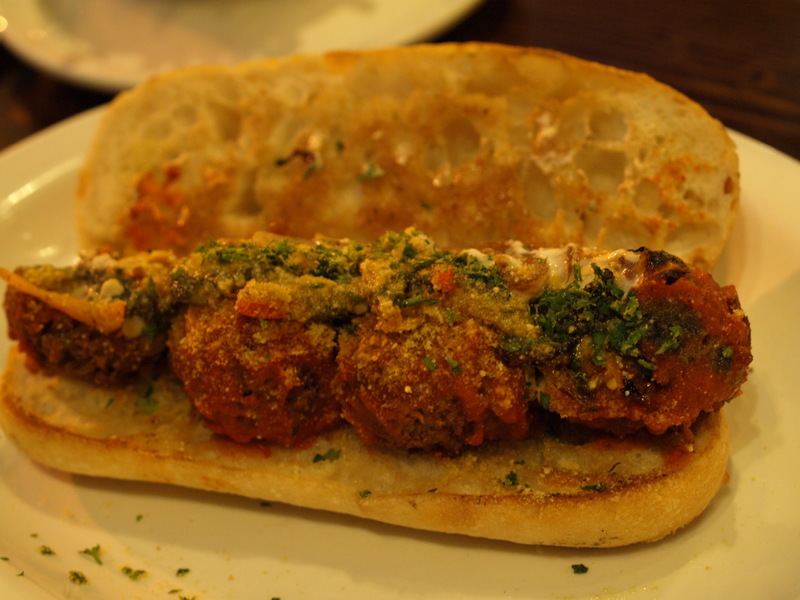 This was a fairly disappointing sandwich, but strangely meatball subs always are. They’re one of those really simple vegan conversions that just never seem to fully translate. Do yourself a favor and pick something else as its just mediocre enough that you’ll be coveting your neighbors food. 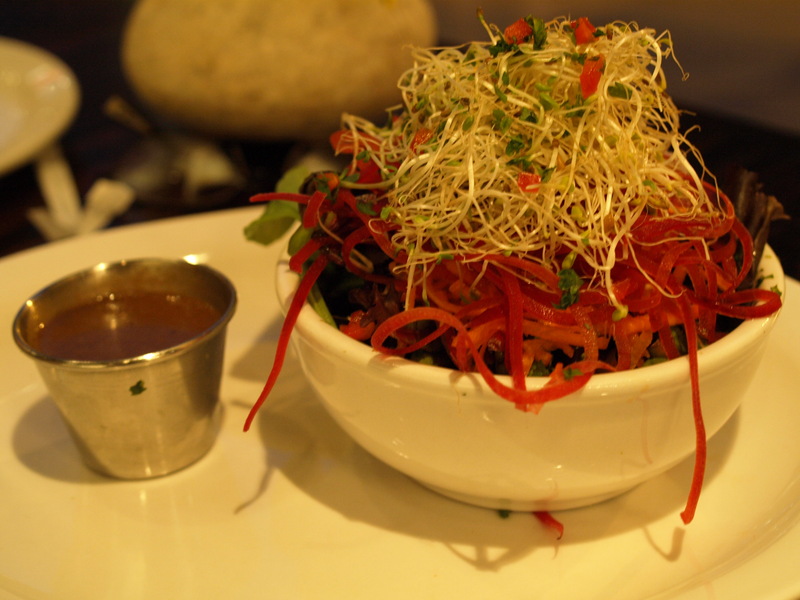 I also ordered the Gandhi Bowl, which was blackened tempeh on a bed of rice, topped with steamed veggies, curry sauce, cranberries and green onions, accompanied by a handful of endamame pods. Out of all the entrees that Lisa and I ordered between us, this one was the best. The tempeh was tasty and had its own unique flavor. The curry sauce was just okay but the star player of this entree was surprisingly the cranberries. I am not the biggest fruit fan. I like vegetables, legumes, and grains. 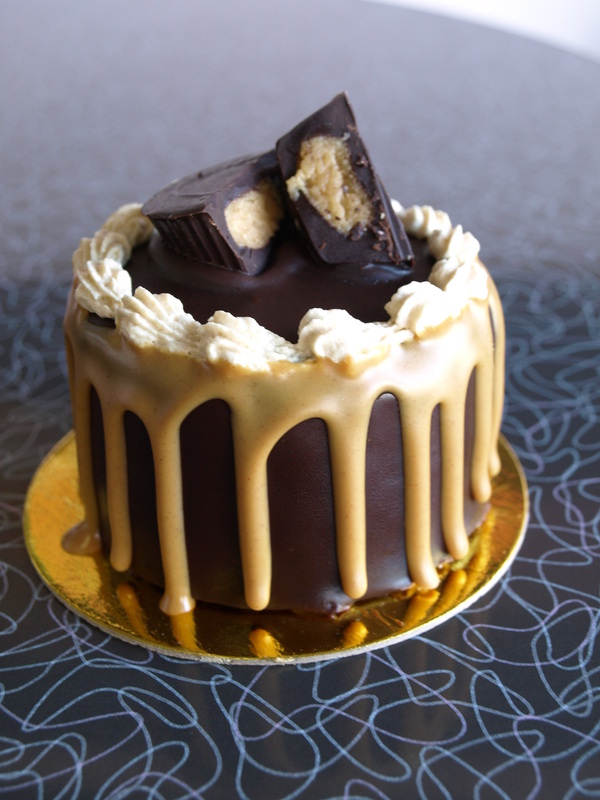 If I’m going to have something sweet I go for the chocolate option every time. That being said though, sometimes I love the salty and sweet combo in a meal and they nailed the contrast between the two perfectly on this one. Out of the 4 entrees I got to try this was the only one I’d order a 2nd time. Which brings me to a couple of points worth discussing. As excited as I am for new vegan options, I have a great distaste for chains coming in and homogenizing an area. One of the greatest joys of being vegan is that it made me step outside the box when it came to dining out. Rather than showing up to a new city and seeking out the nearest chain restaurant for what was familiar, I’d look for the cool local vegan/vegetarian place knowing full well that I’d never know exactly what to expect. Each city I’ve been to has a vegan/vegan-friendly restaurant, some better than others, but they are all unique and different. They have their own menus, their own take on different popular dishes, and their own look, feel, and personality. On a personal level its one of my favorite parts of traveling – knowing that there is some new place out there with a whole new menu for me to plunder and experience. It made me appreciate the unique differences between local establishments, as opposed to the sameness of chain operations, with their predictable menus, highly polished dining environments, and uniform staff. Also, running a small business is difficult and supporting those businesses invested directly into our communities is important. Its fantastic that Tanya Petrovna aka Chef Tanya has built a successful business model out of an all vegan restaurant, but growth for growth’s sake makes me uneasy and dropping 3 new locations into one city seems to fit that bill. Walking into Native Foods you immediately get the chain vibe, like walking into Pizza Fusion or Flat Top Grill. Each restaurant may be a different shape and in a different neighborhood, but everything else is the same and everything has a polished professional presentation that is sterile and bland. Watching the commentary come through on Facebook as all of my friends tried Native Foods out these first 2 weeks has been very interesting. Some people have loved it and some people have hated it, but one of the comparisons that has come up consistently has been to the Chicago Diner. The two restaurants have a lot of overlap in the types of dishes especially the sandwiches. A number of people hyped up on a shiny new place to chow down are decrying the once beloved Diner. Personally I think the Chicago Diner has superior sandwiches and more personality, but Native Foods has that “new and exciting” buzz combined with the fact that it is all vegan. 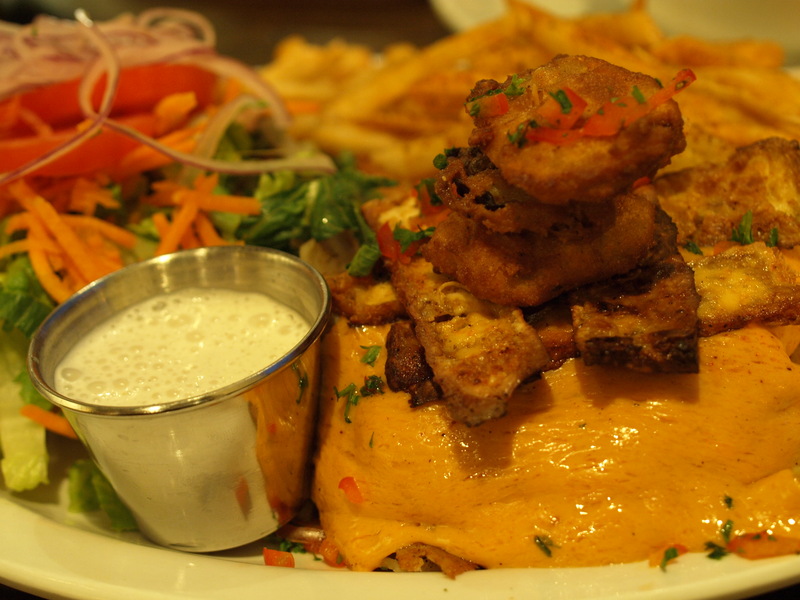 One of my favorite aspects of the Chicago Diner is that they have been evolving over the last 2 years with their menu that changes every few months, their constantly shifting specials, their experimentation with new vegan products like Daiya cheese, Upton’s Seitan, and Breaded Teese Sticks, and their constant fund raising for various causes. I think a lot of the negativity stems from the burnout one experiences when they’ve had the same meal one too many times, but maybe that’s just how I see things. With their willingness to adapt and evolve, hopefully they’ll see the example set by Native Foods that an all vegan business model can be successful and make that move themselves, because personally, that’s the only edge Native Foods has on the Diner. Definitely go check out Native Foods and give it a chance, but don’t forget to support your local stalwarts like the Chicago Diner and Handlebar. 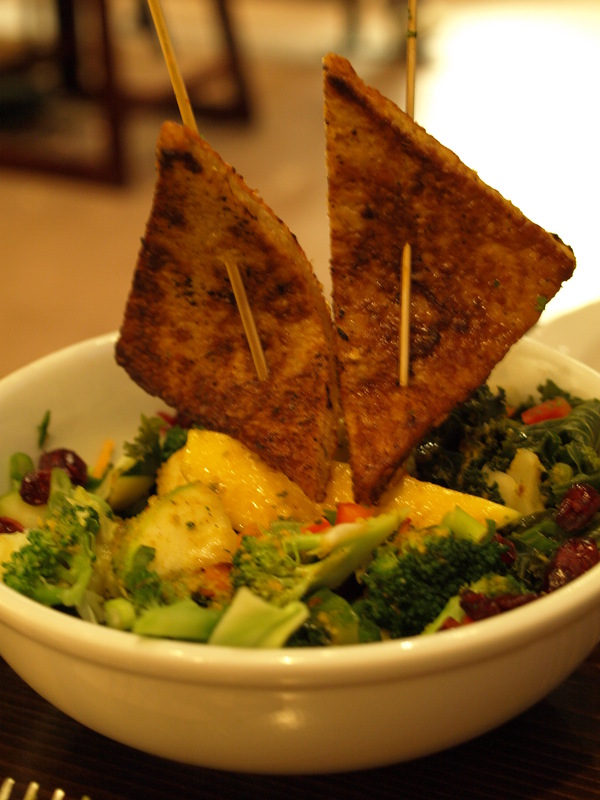 I finally got a chance to try Urban Vegan (1605 W Montrose, 773-404-1109) last week with my friend, Dusty. 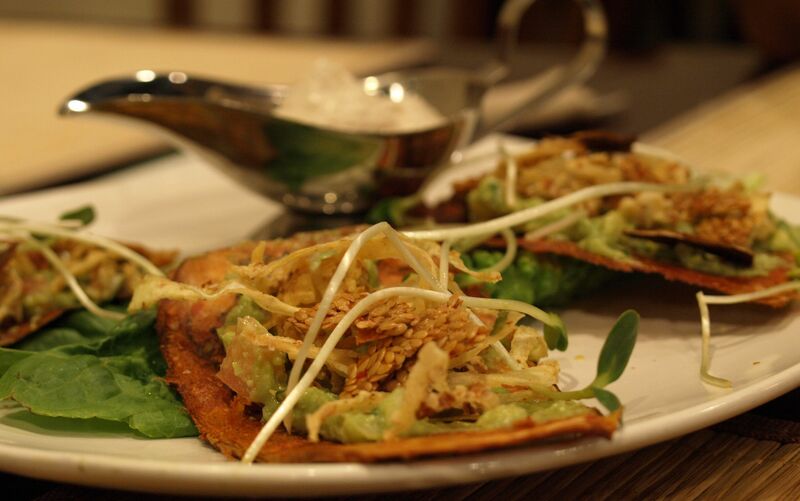 Urban Vegan is a Thai restaurant that has been on the Chicago scene for about a month now. They offer standard Thai fare, a few burgers, wraps and all sorts of tempting beverages on their menu. They also offer both lunch and dinner combinations/specials, and have wheat free menus upon request. It took a while to decide what we wanted. After all we had a whole menu to choose from. How often does that happen? I wanted to try everything, but I restrained myself. Instead, we each ended up ordering an appetizer and a dinner special. I got the Steam Curry Dumpling as an appetizer and Praram’s Plate from the dinner combination menu. 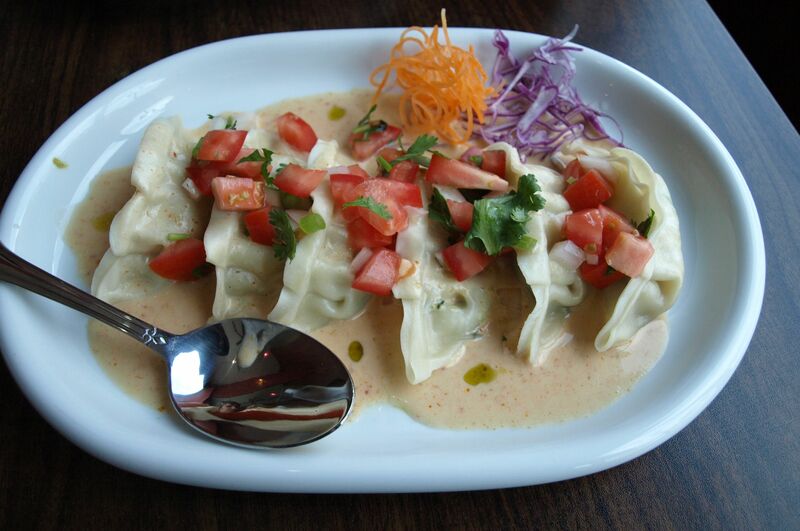 The dumplings are filled with veggies and topped with green curry. They were light and the curry sauce was sweet, though not very spicy, which was disappointing, so I don’t know that I’d order them again. But, if you’re not a fan of heat, these are a good starter ’cause they aren’t very filling, which means you’ll have plenty of room for your entree. 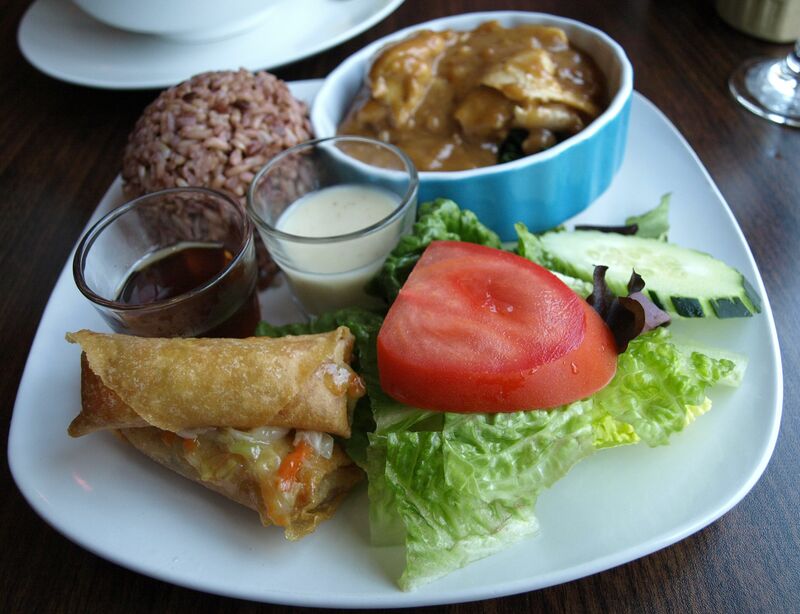 The Praram’s Plate dinner combination consists of steamed brown rice, a salad, 2 spring rolls and soy chicken pan fried with peanut sauce and spinach. The plates were beautifully arranged and my meal was delicious! 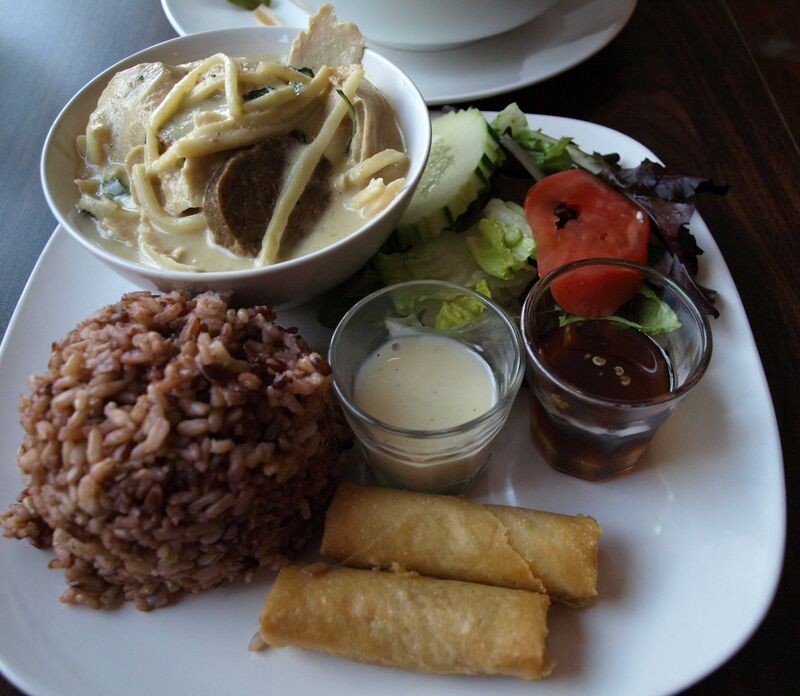 The peanut sauce was creamy and not too oily, the rice was moist and had a nice nutty flavor to it that complemented my entree well and the salad was fresh and came with a really tasty dressing. There wasn’t anything exceptional about the spring rolls, but they weren’t bad. Dusty ordered the Spicy Seafood Soup as an appetizer and the Green Curry dinner special with peppersteak. She asked that the soup be prepared at medium heat, since she wasn’t sure how hot they make their food. It seems like they tend to err on the side of caution, so if you’re looking for Spicy Sea Food soup be sure to ask for spicy, because medium was more mild than medium. 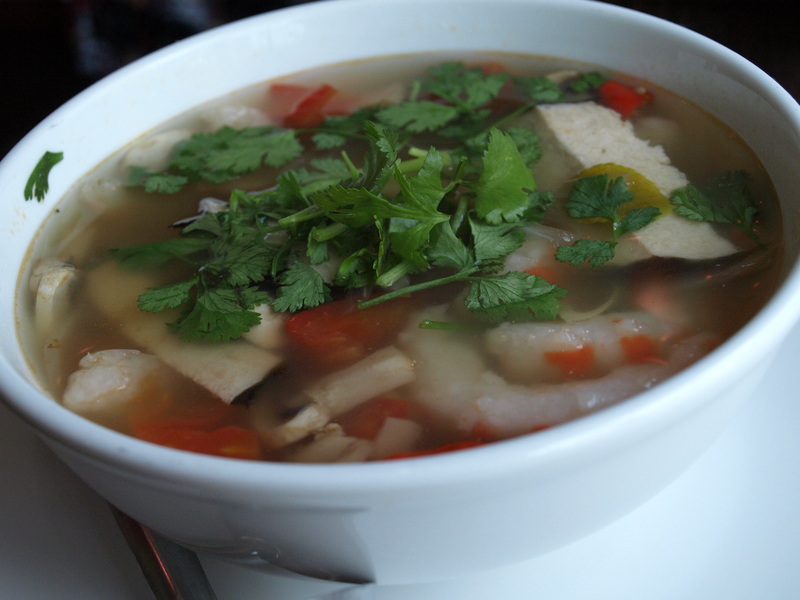 The soup consisted of soy fish, soy shrimp, veggies and herbs in a lemongrass broth. All of the ingredients in the soup were fresh and despite it’s lack of heat, the soup was very good. It was my first experience with soy fish and soy shrimp. I was never a seafood fan pre-veganism, but I actually enjoyed the soup quite a bit. She also approved, except she didn’t like that there were inedible pieces of lemongrass and other herbs in the broth. She also ordered the green curry as medium, so it was mild. She felt the rice also complemented her entree very well. It’s rare to find a good brown rice paired with Asian food, usually most brown rice seems to be too dry or the flavor doesn’t complement the flavors of the other foods it’s with, but this one is very good. The pepper steak was a good addition to the curry. Both of our dinner specials also came with a small bowl of tofu soup, which like the spring rolls, was nothing to write home about, but was a nice addition. 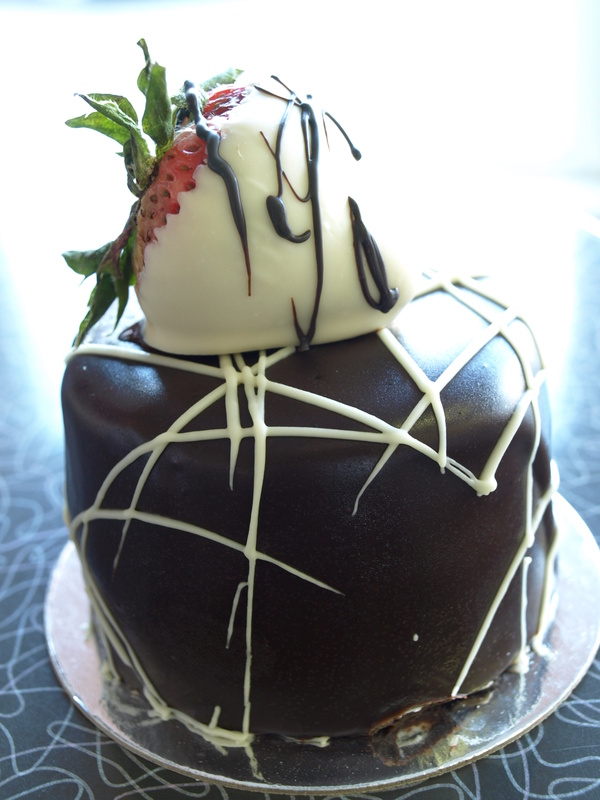 I can’t wait to go back and try some more dishes at Urban Vegan, as well as a smoothie and some dessert! 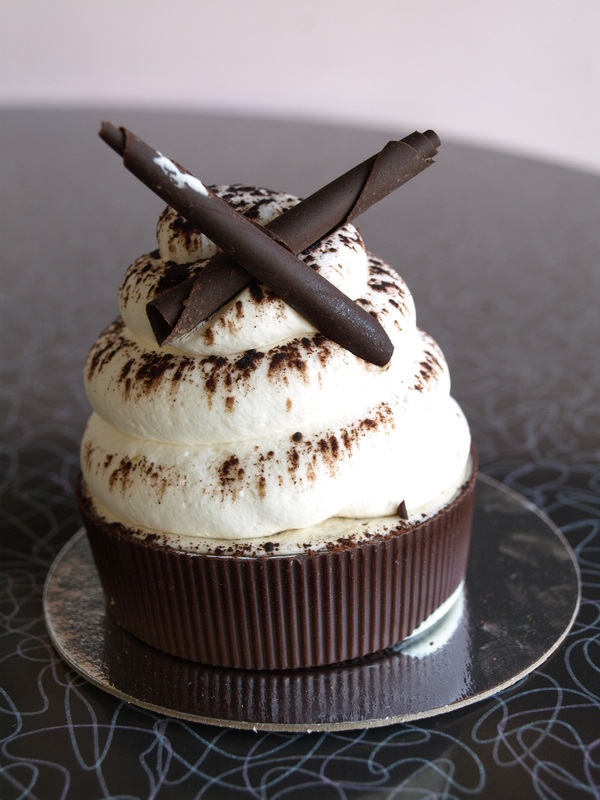 Follow Urban Vegan on Facebook. Mercy for Animals has done it again. Loose Leaf Lounge (2915 N Broadway) will be premiering their new vegan menu tonight starting at 5pm! The vegan menu includes a Grilled Cheese Sandwich with Daiya, tomato and onion, a Ground Seitan Sandwich with avocado, peppers, spinach and Veganaise, a Chorizo Seitan Wrap with avocado, cilantro, and tomato, Vegan Cookies, and more! These items are being added to their menu permanently, so if you can’t check them out tonight, do so soon! I know I will. *Note from Facebook Event Invite regarding tonight: Since Loose Leaf Lounge is a small cafe, seating is not guaranteed and they do not take reservations. To increase your chances of getting a seat, arrive promptly at 5 p.m., after 8 p.m., or come for carry-out! 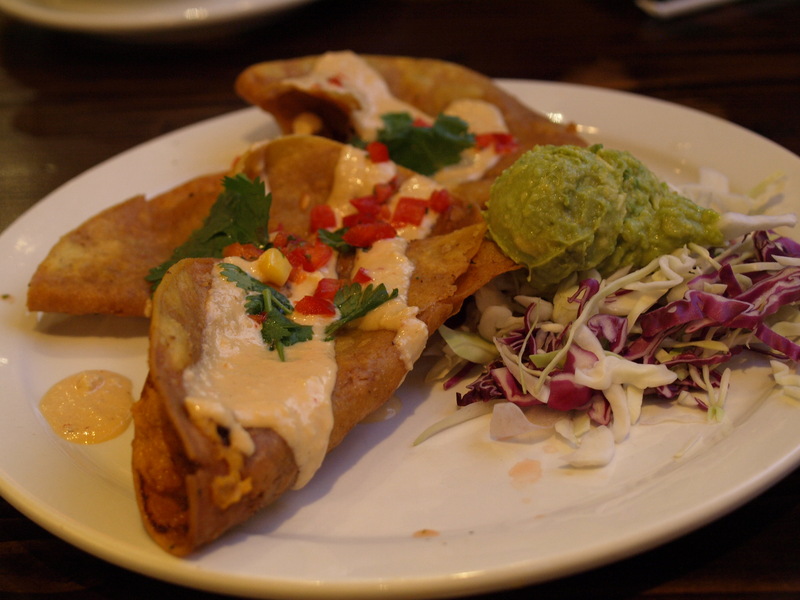 Thanks to one of our readers we recently found out about a new vegetarian Mexican place in Logan Square called Quesadilla, La Reyna del Sur (2235 N. Western, Chicago, IL 773-235-8807), so of course we had to go check the place out right away. 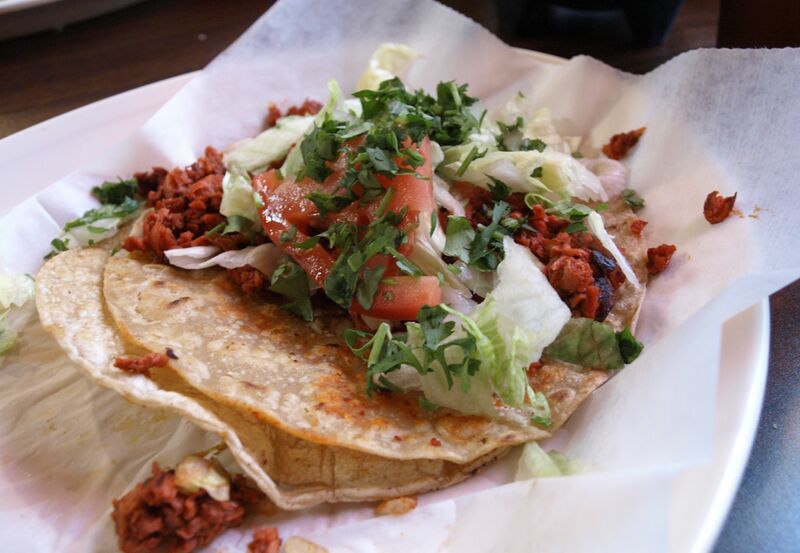 According to our reader, Quesadilla used to be on the south side a few years ago before they disappeared. Now they’re back with a menu filled with food which can be veganized, since their soy-based meats are TVP and they offer both dairy cheese and non-dairy cheese (Follow Your Heart), all at taqueria prices! When we first walked in we went up to the counter to check out the menu and ask questions. When it was established that we were eating in, the friendly woman behind the counter gave us menus and asked us to take a seat at a table. She brought out chips and two types of salsa, both of which were delicious, though she warned us that the chunkier of the two was pretty hot and it was. We munched on chips while we checked out the menu and I was a bit disappointed because the chips were greasy and not very good, but bad chips don’t necessarily mean bad food. Of course we couldn’t write a good review unless we sampled a little bit of everything, so we did. 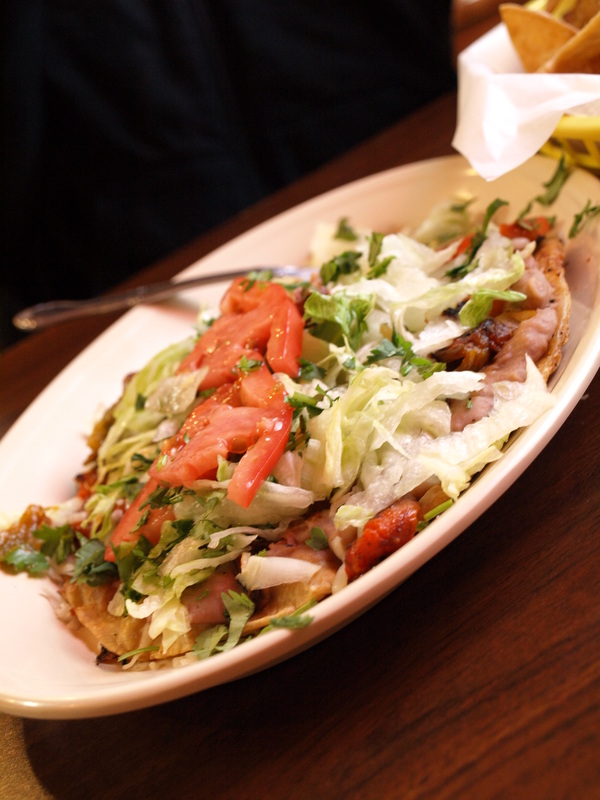 We ordered a Huarache de Rajas, which is a large piece of fried corn dough topped with beans, lettuce, roasted Poblano pepper strips, tomato, cilantro and in our case Follow Your Heart mozzarella. I used to eat huaraches on a weekly basis at a market after school when I was a kid in Mexico and this one was just as large and delicious as those. Unlike the chips, it wasn’t super greasy and all the toppings were fresh, plus who can beat it at $4.75? We also ordered two tacos, 1 chorizo and 1 Al Pastor ($2 each). When they brought out the tacos they both looked exactly the same, so I wasn’t sure which was which and after taking a bite of both I still couldn’t distinguish between the two, which was unfortunate, because I love tacos Al Pastor (so far El Faro is the only restaurant I’ve tried that’s been able to make the perfect vegan Al Pastor taco). However, both tacos were good despite their uniformity. They had a chorizo-like flavor and were slightly spicy. They were served with onion, cilantro, lettuce and tomato and two small tortillas, just like they serve them in Mexico. 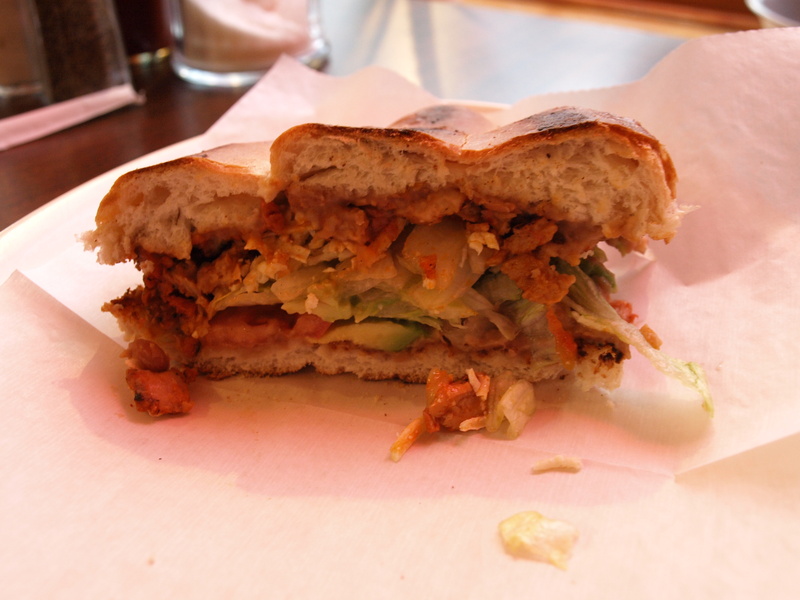 Finally, we also ordered a Veggie Cubana torta ($5.75) which was filled with soy-sausage, bacon and chicken, as well as beans, avocado, tomato and lettuce. Normally they also top them with mayo they make themselves from almonds, but they were out of mayo last night. Even though the huarache was delicious, this was our favorite item. 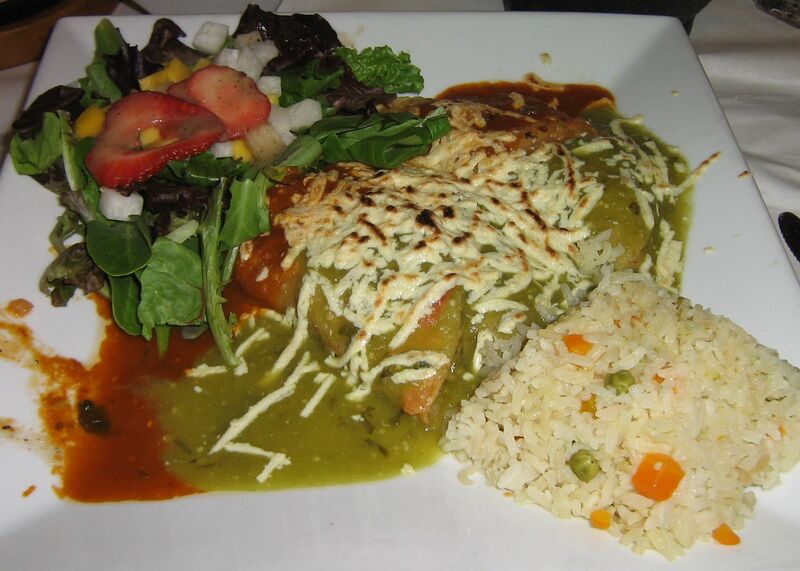 Nothing beats a warm bolillo filled with delicious food. On top of huaraches, tortas and tacos, Quesadilla also offers quesadillas, of course, as well as, a wide variety of fruit and vegetable juices. The woman I spoke with there knew what was up when it came to veganism (she marked our ticket – no butter, soy cheese and no sour cream – for the cook, even though we’d forgotten to ask about butter). She said they’ve only been in their new location for two weeks, but that they’ve been well received. So be sure to pay them a visit soon. 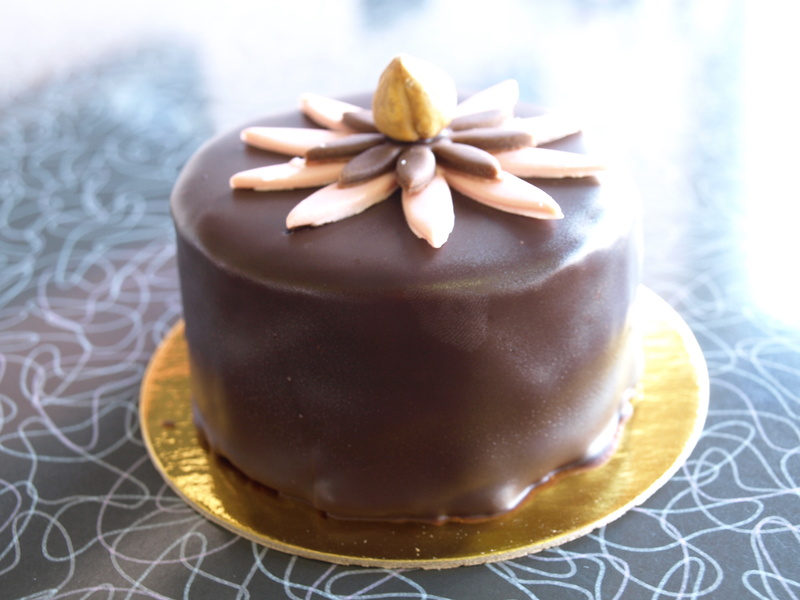 They’re located on the corner of Lyndale and Western and are currently open from 10am-10pm Sun-Fri.
They’re so close to Second City Vegan headquarters I’ve got a feeling we’ll be getting take-out from them on a regular basis! *Special thanks to David S. for giving us the heads up on this place. As always, if any of you know of any hidden vegan/vegan friendly gems within the city we don’t have listed on our restaurant page, or of any new places opening up, let us know so we can spread the word. Melt Bar and Grilled is a haven for those who love music and cheese, both vegan and not. Their walls are covered with movie and music memorabilia and the entrance and main counter have an awesome mural any fan of independent music can appreciate. As their name suggests, they offer a wide variety of melts, including The Kindergarten, which is simply a grilled cheese sandwich. Many of the sandwiches can be made vegan with either vegan cheddar or mozzarella cheese substitutes and you can add all sorts of toppings to them, from grilled veggies to fried tofu. They also offer soups and salads, which also include vegan options. This was our second trip to Melt in Lakewood, Ohio. We’d originally planned on stopping in at The Flaming Ice Cube once again, because the last time we visited Melt, there was a long wait and we like supporting vegan businesses, but unfortunately The Flaming Ice Cube is closed on Sundays. When we got to Melt we were informed there was a 2 hour wait to dine in and a 45 minute wait for take-out, so we went the take-out route and ate in the car. Both Nick and I got The Kindergarten, but with different toppings. I am a big fan of grilled cheese sandwiches. They were one of the things I missed most when I first went vegan, until I discovered vegan cheeses that melt nicely, like Daiya, Ste Martaen and Tofutti. This sandwich is better than anything I’d ever make myself at home though. The bread was thick, and toasted just right (not too crunchy, not too soft and no burnt spots!). I got mine with mozzarella vegan cheese (I think they use Tofutti for the mozzarella, though they would neither confirm nor deny), tomato, grilled onions and grilled peppers. It was delicious! The only thing that would’ve made it better would be fresh avocado, which was on the menu of toppings, but is $1.50 extra and as much as I like avocado, I decided to skip it. The cheese was melted perfectly, my only complaint was that my grilled peppers were a little over cooked, so they didn’t add much flavor to the sandwich. 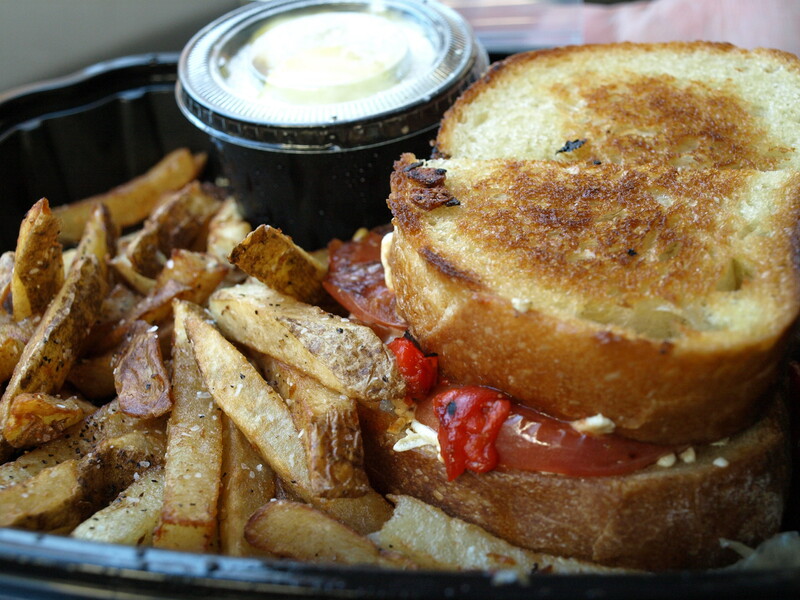 The last time we visited Melt, I got The Kindergarten with the vegan cheddar cheese and tomato, it was better than my choice this time around, but both were worth the wait.